American test pilot astronaut 1959-1974. First American in space. Grounded on medical grounds during Gemini, but reinstated, becoming fifth person to walk on the moon. Millionaire entrepreneur on the side. Status: Deceased; Active 1959-1974. Born: 1923-11-18. Died: 1998-07-21. Spaceflights: 2 . Total time in space: 9.01 days. Birth Place: Derry, New Hampshire. Shepard was the son of Alan Bartlett Shepard Sr., a retired Army colonel, and Renza Emerson Shepard. As a child in New Hampshire he excelled in school, and became fascinated with airplanes. On weekends he rode his bicycle ten miles to the local airport, where he did odd jobs in exchange for rides. After graduation from high school and a year at the Admiral Farragut Academy in New Jersey, he entered the US Naval Academy, graduating 462nd in a class of 913. Bachelor of Science from U.S. Naval Academy. Shepard served as an ensign aboard the destroyer Cogswell in the Pacific during World War II. After the war, he became a naval aviator. After several tours of duty in the Mediterranean, Shepard became a Navy test pilot, conducting development tests of fighters (F4D Skyray, F11F Tigercat, F2H3 Banshee, F5D Skylancer). He also helped work out landing techniques for the Navy's new angled-deck aircraft carriers. Shepard was selected in 1959 to be one of the seven Mercury astronauts and, evaluated as best of the group, was chosen in 1960 to be the first American in space. After Yuri Gagarin became the first human in space in the orbital flight of Vostok 1 on April 12, 1961, the pressure for Shepard to be launched became enormous. Delays pushed Shepard's launch back from May 2 to May 5, 1961. After his brief 15 minute flight Shepard splashed down 65 km from Bermuda and was hoisted aboard a Marine helicopter that took him to the aircraft carrier Lake Champlain. A day later, President Kennedy awarded him the Distinguished Service Medal, and a parade in Washington two days after that drew 250,000 people. An ear problem grounded Shepard and he was put in charge of the astronauts' office for the next ten years. After surgery corrected the problem, he was put in command of the Apollo 14 moon mission that was launched on January 31, 1971. Shepard retired in 1974 from NASA and the Navy as a Rear Admiral and devoted full time to the business activities that had made him a millionaire even before he left NASA. He became chairman of Marathon Construction Corp. in Houston, and joined the boards of directors of several companies. His Seven Fourteen Enterprises (named for Freedom 7 and Apollo 14) served as an umbrella company for his diverse business interests. Shepard and wife, Louise -- they had three daughters -- had homes in Houston's River Oaks section, Breckenridge, Colorado, and Pebble Beach, California. In his later years, Shepard spent most of his time in Pebble Beach. In 1996 he was diagnosed with leukemia, passing away two years later in Monterey, California. Died in Monterey, California. Born November 18, 1923, in East Derry, New Hampshire. Died on July 21, 1998. He is survived by wife, Louise; daughters Julie, Laura and Alice, and six grandchildren. Attended primary and secondary schools in East Derry and Derry, New Hampshire; received a Bachelor of Science degree from the United States Naval Academy in 1944, an Honorary Master of Arts degree from Dartmouth College in 1962, and Honorary Doctorate of Science from Miami University (Oxford, Ohio) in 1971, and an Honorary Doctorate of Humanities from Franklin Pierce College in 1972. Graduated Naval Test Pilot School in 1951; Naval War College, Newport, Rhode Island in 1957. Fellow of the American Astronautical Society and the Society of Experimental Test Pilots; member of the Rotary, the Kiwanis, the Mayflower Society, the Order of the Cincinnati, and the American Fighter Aces; honorary member, Board of Directors for the Houston School for Deaf Children, Director, National Space Institute, and Director, Los Angeles Ear Research Institute. Congressional Medal of Honor (Space); Awarded two NASA Distinguished Service Medals, the NASA Exceptional Service Medal, the Nave Astronaut Wings, the Navy Distinguished Service Medal, and the Navy Distinguished Flying Cross; recipient of the Langley Medal (highest award of the Smithsonian Institution) on May 5, 1964, the Lambert Trophy, the Kinchloe Trophy, the Cabot Award, the Collier Trophy, the City of New York Gold Medal (1971), Achievement Award for 1971. Shepard was appointed by the President in July 1971 as a delegate to the 26th United Nations General Assembly and served through the entire assembly which lasted from September to December 1971. In 1950, he attended the United States Navy Test Pilot School at Patuxent River, Maryland. After graduation, he participated in flight test work which included high-altitude tests to obtain data on light at different altitudes and on a variety of air masses over the American continent; and test and development experiments of the Navy's in-flight refueling system, carrier suitability trails of the F2H3 Banshee, and Navy trials of the first angled carrier deck. He was subsequently assigned to Fighter Squadron 193 at Moffett Field, California, a night fighter unit flying Banshee jets. As operations officer of this squadron, he made two tours to the Western pacific onboard the carrier Oriskany. Rear Admiral Shepard was one of the Mercury astronauts named by NASA in April 1959, and he holds the distinction of being the first American to journey into space. On May 5, 1961, in the Freedom 7 spacecraft, he was launched by a Redstone vehicle on a ballistic trajectory suborbital flight--a flight which carried him to an altitude of 116 statute miles and to a landing point 302 statute miles down the Atlantic Missile Range. Shepard made his second space flight as spacecraft commander on Apollo 14, January 31 - February 9, 1971. He was accompanied on man's third lunar landing mission by Stuart A. Roosa, command module pilot, and Edgar D. Mitchell, lunar module pilot. Maneuvering their lunar module, Antares, to a landing in the hilly upland Fra Mauro region of the moon, Shepard and Mitchell subsequently deployed and activated various scientific equipment and experiments and collected almost 100 pounds of lunar samples for return to earth. Other Apollo 14 achievements included: first use of Mobile Equipment Transporter (MET); largest payload placed in lunar orbit; longest distance traversed on the lunar surface; largest payload returned from the lunar surface; longest lunar surface stay time (33 hours); longest lunar surface EVA (9 hours and 17 minutes); first use of shortened lunar orbit rendezvous techniques; first use of colored TV with new vidicon tube on lunar surface; and first extensive orbital science period conducted during CSM solo operations. Departed Date: 1974-08-01. Cause of Death: Natural causes - Leukemia, two years after diagnosis.. Total EVA Time: 0.39 days. Number of EVAs: 3. Marital Status: Married. Children: Two children. Education: Annapolis;Patuxent. Family: Astronaut. Country: USA. Spacecraft: Mercury. Flights: Mercury MR-3A, Mercury MR-3, Mercury MA-9A, Mercury MA-9, Mercury MA-10, Apollo 14. Projects: Apollo. Agency: USN. Bibliography: 12, 6024. 1923 November 18 - . Birth of Alan Bartlett Jr 'Al' Shepard - . Nation: USA. Related Persons: Shepard. American test pilot astronaut 1959-1974. First American in space. Grounded on medical grounds during Gemini, but reinstated, becoming fifth person to walk on the moon. Millionaire entrepreneur on the side. 2 spaceflights, 9.0 days in space. Flew to orbit on Apollo 14 (1971). 1959 April 2 - . Seven astronauts selected for Mercury project. - . Nation: USA. Related Persons: Carpenter, Cooper, Glenn, Grissom, Schirra, Shepard, Slayton. Class: Manned. Type: Manned spacecraft. Spacecraft: Mercury. Seven astronauts were selected for Project Mercury after a series of the most rigorous physical and mental tests ever given to U.S. test pilots. Chosen from a field of 110 candidates, the finalists were all qualified test pilots: Capts. Leroy G. Cooper, Jr., Virgil I. Grissom, and Donald K. Slayton, (USAF); Lt. Malcolm S. Carpenter, Lt. Comdr. Alan B. Shepard, Jr., and Lt. Comdr. Watler M. Schirra, Jr. (USN); and Lt. Col. John H. Glenn (USMC). NASA Astronaut Training Group 1 selected. - . Nation: USA. Related Persons: Carpenter, Cooper, Glenn, Grissom, Schirra, Shepard, Slayton. The group was selected to provide six pilots for the single-crew Mercury manned spacecraft. Originally a wide pool of candidates was going to be considered, but in December 1958 President Eisenhower ruled that military test pilots would form the candidate pool.. Qualifications: Qualified jet pilot with minimum 1,500 flight-hours/10 years experience, graduate of test pilot school, bachelor's degree or equivalent, under 40 years old, under 180 cm height, excellent physical condition.. Screening of military service records showed 110 military officers that met these criteria. These 110 were to be called in three groups for briefings on the Mercury program. Of the first two groups of 35 called, 56 volunteered for further physical and psychiatric tests. This provided enough candidates and the third group was never even called for a briefing or asked if they would like to volunteer. Of the 56 tested, seven were finally selected (no objective way was found to reduce the seven finalists to six). Of the seven astronauts, all eventually flew in space. Grounded due to a heart murmur, Slayton had to wait 16 years for his flight aboard the last Apollo mission. Glenn left for a career in politics after becoming the first American to orbit the earth, but returned to space aboard a shuttle over 36 years later in a NASA publicity stunt. Schirra was the only astronaut to fly aboard Mercury, Gemini, and Apollo spacecraft. Shepard was the only one to reach the lunar surface (after being grounded for a medical condition during the Gemini program). Grissom would die in the Apollo 204 ground fire. 1961 February 21 - . First Mercury crews selected. - . Nation: USA. Related Persons: Glenn, Grissom, Shepard. Spacecraft: Mercury. NASA Space Task Group selected John H. Glenn, Jr., Virgil I. Grissom, and Alan B. Shepard, Jr., to begin special training for first manned Mercury space flight..
Glenn, Grissom, and Shepard selected to begin training for the first manned Mercury flight. - . Nation: USA. Related Persons: Glenn, Grissom, Shepard. Spacecraft: Mercury. Astronauts John Glenn, Virgil Grissom, and Alan Shepard were selected by the Space Task Group to begin special training for the first manned Mercury flight..
1961 May 8 - . Shepard awarded NASA's Distinguished Service Medal - . Nation: USA. Related Persons: Kennedy, Shepard. Flight: Mercury MR-3. Spacecraft: Mercury. Astronaut Alan Shepard, pilot of the Freedom 7 spacecraft (MR-3) was awarded NASA's Distinguished Service Medal by President John F. Kennedy in a ceremony at the White House. It was followed by an informal parade to the Capitol by the seven astronauts for lunch, and a press conference at the State Department auditorium. Shepard and Grissom awarded the first Astronaut Wings - . Nation: USA. Related Persons: Grissom, Shepard. Spacecraft: Mercury. In a joint ceremony, astronauts Alan Shepard and Virgil Grissom were awarded the first Astronaut Wings by their respective services..
1963 February 21 - . Cooper, Shepard briefed on experiments for Mercury MA-9 - . Nation: USA. Related Persons: Cooper, Shepard. Flight: Mercury MA-9. Spacecraft: Mercury. Gordon Cooper and Alan Shepard, pilot and backup pilot, respectively, for the Mercury-Atlas 9 (MA-9) mission, received a 1-day briefing on all experiments approved for the flight. Also at this time, all hardware and operational procedures to handle the experiments were established. Cooper and Shepard received runs on the centrifuge for Mercury training - . Nation: USA. Related Persons: Cooper, Shepard. Flight: Mercury MA-9. Spacecraft: Mercury. For the purpose of reviewing the MA-9 acceleration profile, pilot Gordon Cooper and backup pilot Alan Shepard received runs on the Johnsville centrifuge..
1963 April 5 - . Cooper and Shepard visited the Morehead Planetarium for Mercury training - . Nation: USA. Related Persons: Cooper, Shepard. Flight: Mercury MA-9. Spacecraft: Mercury. Gordon Cooper and Alan Shepard, MA-9 pilot and backup pilot, visited the Morehead Planetarium in North Carolina to review the celestial sphere model, practice star navigation, and observe a simulation of the flashing light beacon (an experiment planned for the MA-9 mission). 1963 April 10-11 - . Recovery and egress training for Cooper and Shepard in preparation for Mercury MA-9 - . Nation: USA. Related Persons: Cooper, Shepard. Flight: Mercury MA-9. Spacecraft: Mercury. Full-scale recovery and egress training was conducted for Gordon Cooper and Alan Shepard in preparation for the Mercury MA-9 mission. During the exercise, egresses were effected from the spacecraft with subsequent helicopter pickup and dinghy boarding. The deployment and use of survival equipment were also practiced. 1971 February 5 - . 14:42 GMT - . EVA Apollo 14-1 - . Crew: Mitchell, Shepard. EVA Duration: 0.20 days. Nation: USA. Related Persons: Mitchell, Shepard. Program: Apollo. Class: Moon. Type: Manned lunar lander. Flight: Apollo 14. Spacecraft: Apollo LM. Explored lunar surface near LM and deployed ALSEP unmanned scientific station equipment..
EVA Apollo 14-3 - . Crew: Mitchell, Shepard. EVA Duration: 0.0014 days. Nation: USA. Related Persons: Mitchell, Shepard. Program: Apollo. Class: Moon. Type: Manned lunar lander. Flight: Apollo 14. Spacecraft: Apollo LM. Internal Vehicular Activity. Threw excess equipment out of LM before lift-off..
1971 February 6 - . 08:11 GMT - . EVA Apollo 14-2 - . Crew: Mitchell, Shepard. EVA Duration: 0.19 days. Nation: USA. Related Persons: Mitchell, Shepard. Program: Apollo. Class: Moon. Type: Manned lunar lander. Flight: Apollo 14. Spacecraft Bus: Apollo LM. Spacecraft: Apollo MET. Attempted to reach rim of Cone Crater on moonwalk with ''golf cart'' for hauling equipment..
1971 February 9 - . Landing of Apollo 14 - . Return Crew: Mitchell, Roosa, Shepard. Nation: USA. Related Persons: Mitchell, Roosa, Shepard. Program: Apollo. Flight: Apollo 14. 1998 July 21 - . Death of Alan Bartlett Jr 'Al' Shepard - . Nation: USA. Related Persons: Shepard. American test pilot astronaut 1959-1974. First American in space. Grounded on medical grounds during Gemini, but reinstated, becoming fifth person to walk on the moon. Millionaire entrepreneur on the side. 2 spaceflights, 9.0 days in space. Flew suborbital on Mercury MR-3 and to the moon on Apollo 14 (1971). Died of leukemia, two years after diagnosis. 1998 July 22 - . 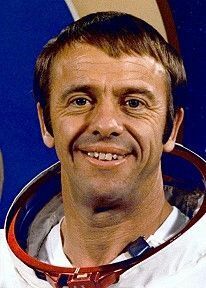 Death of astronaut Alan Bartlett (Al) Shepard Jr - . Nation: USA. Related Persons: Shepard. American test pilot astronaut 1959-1974. First American in space. Grounded for medical reasons during Gemini, but reinstated, becoming fifth person to walk on the moon. Millionaire entrepreneur on the side. 2 spaceflights, 9.0 days in space. Flew to the moon on Apollo 14 (1971). Died at age of 74 of leukemia, two years after diagnosis.